In the early '80s, there were very few colleges offering post-graduate in media courses, which clearly did not matter during that time. There was only one television channel and it did not offer much by way of news or even entertainment. There was no internet, and no mobile phones either. The opening up of the economy, and everything that liberalization brought with it, was still many years away. With fewer distractions and longer attention spans, it was a more civilized time. There seemed to be more time to learn on the job and for colleagues to teach the ropes at work. However, it is not the case today. With more than a hundred television news channels, a few thousand newspapers and magazines are engaged in a race for both audiences and advertisers, the competition has become so fierce that new recruits at the entry level no longer have any breathing space. They are still expected to have the right attitude and to learn many things on the job. However, no one has the time to hold their hand as they attempt to navigate through the treacherous currents of the media ocean. Therefore, the industry today prefers to hire only those who have a master's degree or those who at least have a postgraduate diploma from an institute that has a reputation for providing quality journalism education. What do students expect from a media course today? In brief, they want to learn everything that will enable them to gain a foothold in the industry. What does the industry expect of a media institute? Today, the media industry expects a fresher to deliver like a professional from day one. So, the syllabus and curriculum is required to have a balance theory and practical projects. Students need to have their own work output in terms of publishing newspaper, or their own television news bulletins having montage, graphics, piece-to-camera and many more. The colleges should have excellent industry tie-ups and arrange for internships with the best media outlets in the country, which will give the students a feel of the real world and give them an opportunity to apply everything they have been taught. The problem lies mostly at the undergraduate level where out-of-date syllabi continue to rule the roost. Many young media aspirants who have studied journalism as a subject for three years as part of their B.A. or B.B.M. course may have been taught plenty about the history of Indian journalism but they remain shockingly unaware of the basics of newspaper production. For instance, they have no idea who does what in a newspaper. They come into a master's course believing that the job of a newspaper editor, the top boss, is to "go through, select, and edit" every story or they think the editor's only job is to write editorials. Most undergrad students are also expected to find their own media internships, which only compound their problems. When journalism schools came in for severe criticism, Justice Markandey Katju, the Chairman of the Press Council of India set up a committee to determine minimum qualifications to become a journalist. What caused surprise, though, was that this move immediately drew fire from many senior journalists. This was a surprise because 20 years ago, or even further back, it was perhaps enough to be literate and have an interest in reading and writing to become a journalist. However, as discussed above, that is not the case today. Veteran journalist and journalism teacher V. Gangadhar in an article in The Hindu insisted that journalism schools must improve. Gangadhar gave example of Mumbai University, which, he said, granted affiliation to dozens upon dozens of B.M.M. and B.M.S. departments without caring to examine whether they had any kind of infrastructure such as library facilities, classrooms, and qualified teachers. "After a couple of years, the university, in its wisdom, abolished entrance tests," he wrote, "and decided that applicants to these courses should be admitted on the strength of their 10+2 marks, completely ignoring the fact that the cramming habits of, and inflated marks awarded by junior colleges are not enough to judge the different needs of a journalism course." What about the quality of students seeking to enter journalism? If youngsters, who have no interest in reading, cannot write two paragraphs in grammatically correct English. If they refuse to understand that to be a good writer you first have to be a good reader, then it is a serious problem. Despite the best efforts of their teachers, these students decline to apply themselves, either because they do not want to or because they are unable to. Should we care about the quality of journalism education? The answer lies in the lucid assertion by Howard Finberg, an American journalist with more than 40 years' experience who now works with The Poynter Institute, a world-class journalism school. Finberg wrote in an article on Poynter.org, "Without a robust future for journalism education, it is harder to see a robust future for journalism. And that's bad for democracy and for citizens who depend on fair and accurate information." 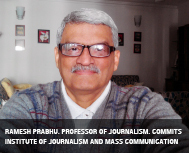 A journalist with over 25 years experience in print and broadcast journalism, Ramesh has had eventful stints at Mid Day, Khaleej Times and CIO India.